Sparesology is a term coined by Slater to describe the discipline of optimizing the physical, financial, and human resource management processes of spare parts inventory management. Sparesology is much more than just inventory optimization. It involves an understanding of the complete “ecosystem,” within which the spare parts inventory is managed, and seeks to ensure that all of the factors influencing this management work together to achieve an organization’s goals. • Ch 1: Establishing Your Spare Parts Management System: What is MRO and Spare Parts? 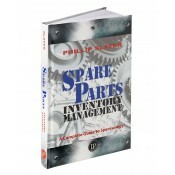 ; The #1 Problem with Spare Parts Management; The Big Picture – Putting Spare Parts in Context; Why Spare Parts are Different (than other inventory types); Standard Supply Chain Tools that Don’t Work with (Most) Spare Parts; Financial Considerations; Inventory Prevention; Inventory Management Policies. • Ch 2: Best Practice Spare Parts Management: Best Practice Research; The Five Best Practices that Make a Real Difference. • Ch 3: The Spare Parts Management Life Cycle: Creation; Operation; Obsolescence and Disposal. • Ch 4: Implementing Your Spare Parts Management System: How to Go From a Pilot Program to Productive Execution. Phillip Slater has more than 25 years of business improvement experience. While the last 15 of these have been spent in operations and management consulting, the first 10 were spent ‘hands on in industry learning by direct experience. It was during this time, and by learning from both his successes and failures, that Phillip developed many of the approaches that his company, Initiate Action, applies today.